When researching a blog post on terrible business writing, I kept running across the work of Ron Denholm from Essay Audit. He had great examples of terrible writing and a lot to say about how to fix it. Knowing it&apos;s better to learn from the master, I asked him to guest post for me and he graciously agreed. * Ron has a BA and MA both in Classics. He headed Learning and Development for the Australian Federal Police in Sydney where he developed effective e-learning writing courses, and received a Commissioner&apos;s Commendation for improving Ministerial writing. (I say give the guy a medal!) Ron has trained over 2,500 people in efficient writing. Over to Ron. If you&apos;re in business, your time is valuable. You love a quick-fix read over a donut and coffee. You leap at numbered iron-clad reasons, scanning bullet-proof tips, and delight in tight analysis and compelling opinion. And your mouse click is judge and executioner. You&apos;ll tolerate a few glitches in grammar spellling and punctuation but not so long sentences with a lethally toxic cocktail of poor articulation excessive tangential clauses spiced with malodorously inflated and archaic vocabulary and technical specification terms the author uses of which you may not be aware but of which the ramifications of you not picking up on them are that you may miss a really prescient comment hidden fathom deep in the meandering syntax of a lazy writer using comic sans font in 10 point size enveloped in long paragraphs or a sloppy direct translation from another language too fond of emotionally charged redundant adjectives and wonderfully conjured adverbs that hide the message. Where did you give up reading in the last paragraph? How patient were you with the language? How much of the message did you understand? Few readers would struggle through unless the read was mandatory. And let&apos;s face it, reading time is valuable because we are time-poor. What&apos;s poor writing costing you? Writing inefficiently is part of a hidden economy and it&apos;s costing us millions. Of course, it will not always read like the horror above, but it will have some common elements. Now take a look at my presentation showing how inefficient writing can be very costly. Our company, MiningNexus, recently studied 5500 web sites for their readability. The research found an average 35% of surveyed text was not efficiently written. The big risk in inefficient text is that potential clients and investors will go elsewhere, because they are time-poor readers, and readily click off writing that strains their patience. And there is enough excellent business writing out there to make competition fierce. But identifying and measuring the problem is only the first step. What about a solution? MiningNexus worked on that one too. We invented a handy electronic document checker we call EssayAudit: a bullet-proof benchmark for business writers. The program reports on the amount of known fact, analysis and opinion, and the impact on the reader. It also assesses your document for readability. Here is an example. EssayAudit is the world&apos;s first writing checker to benchmark both content and readability. It helps give readers what they deserve: a compelling message wrapped in an easy read. Seasoned bloggers and article writers are using EssayAudit to maximise reader impact and to make sure their text is consistently highly readable. 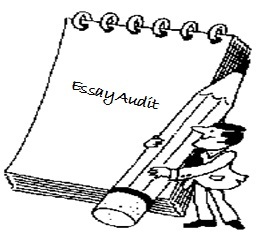 Businesses, web copy writers and schools are also using EssayAudit to set writing benchmarks. 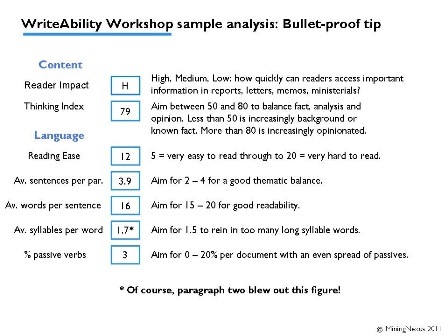 If you&apos;d like to use EssayAudit, contact ron@writeabilityworkshop.com. * I have no affiliation with Ron or Essay Audit; I just appreciate what he&apos;s doing.